Expert opinion is that these panels are English, most likely East Anglian, though as yet not absolutely proven. i) 52¾" x 20¼" (1,34m x 51.5cm). ii) 52¼" x 13" (1,32.5m x 33cm). iii). 46¼" x 10½ (1,17.5m x 26.5cm). 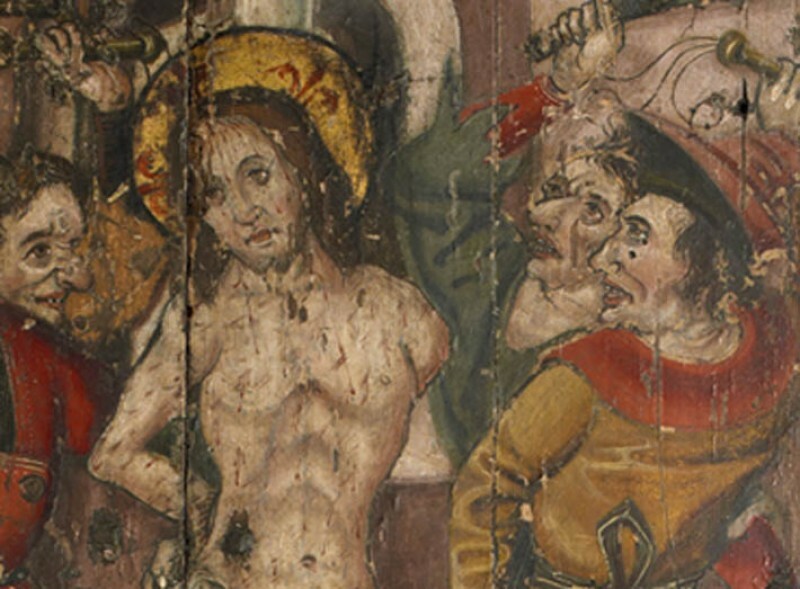 The three fragments of panels depict the Passion in a narrative sequence, each scene demarcated by painted borders. They show Christ washing St. Peter's feet, Christ before Pontius Pilate, the Mocking of Christ, The Placing of the Crown of Thorns, the Scourging of Christ, and Christ carrying the Cross. 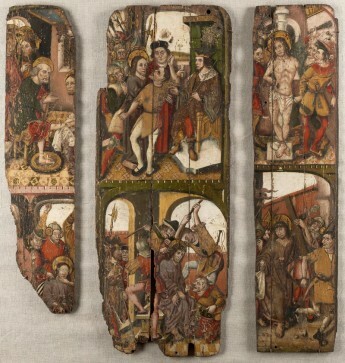 These are evidently part of a larger narrative, and the remaining scenes probably would have included Christ's Entry into Jerusalem, the Last Supper, the Agony in the Garden, the Kiss of Judas, Peter's Three Denials, the Crucifixion, the Deposition, the Pièta, the Entombment and the Resurrection. The most complete panel suggests that the original work would have been of significant size. These fragments were most probably, therefore, part of an altarpiece: a reredos or retable. 1. John Martin Robinson, Treasures of the English Churches, 1995, p. 74. 2. See Roy Strong, Lost Treasures of Britain, 1990, especially chapters 3 and 6.